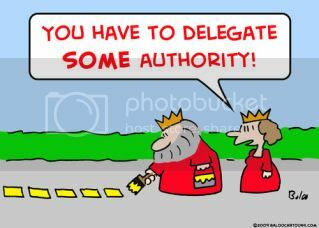 Delegate. THE most important word in an engaged couple's vocabulary. From the minute you get engaged, every single person you know will offer to help you. Some people, you will want to smile at politely and say, "Oh! That's so great that your teenage nephew has his own camera but I have already fallen in love with this fab photographer!". Some people, you will run to with open arms and not let go until burly men pry you off. These are the people who's skills and talents you will need to embrace and accept. TRUST ME!!! You will be much happier (and calmer) if you do. Asked my future sister-in-law to handle the rehearsal dinner (she's a former event planner for the Gordon Hartman Foundation). I needed someone to set-up and decorate the dinner portion of the evening so that I could concentrate on the rehearsal part of the evening. She's super excited and already thinking up ideas and a budget. Asked my former employer (I was her nanny!) to be my on-site wedding coordinator. I absolutely wanted a wedding coordinator for the days leading up to (and of) the wedding. I also wanted this person to love me but not be related to me in any way (so that any problems or issues wouldn't be brought up at every. single. holiday. dinner.). Enter Jody (here are some AWESOME photos of her finishing the LA Marathon). I thought of the super organized birthday parties that Jody used to throw for her daughters and asked her if she'd be up for it. She was and I'm really looking forward to having someone so amazing handle the schedule of and all the little last minute details of the wedding. The Boy is doing the booze. I don't drink and could care less about even having alcohol at the wedding but the Texas and California attendees have a friggin' heart attack if there's no drinkies. So! The Boy has been assigned to think up a budget and alcohol menu and seeing it through to the buying and staging. I'll be over at the lemonade. My best friend (and matron-of-honor) is doing my hair and make-up. This was one of the first things that she said to me after I got engaged ("So, will you let me do your make-up and hair?!?!") and harkens back to when we were roommates in LA. I'm not good at being a girl – so whenever we went out, she always did my hair and make-up. I love that we'll be doing this little ritual again. Landscaping our property is going to be a HUGE job. And my future father-in-law used to be a professional landscaper. He's willing to mastermind, plan, and help execute the entire landscaping project! Yay! Some of you are going to have a SERIOUS jaw-dropping moment when I tell you this but… I delegated the finding of my wedding gown to my wedding party. I KNOW! But hear me out, I'm not very good at being a girl. I have never really wore dresses, I have never dreamed about what my wedding dress would look like, and when I was thinking about what was important to me (wedding-wise) – the dress was so far down the list that it was a negative number. So, I gave the job to them – find me a wedding dress. And they were SO excited (it was really cute!) to help me. I got lots of emails with links and ideas and images. It was great – I'll be really buckling down later this year and looking them all over. The Boy and his best man will be making all the benches and tables for the ceremony and the reception. I don't want anything fancy and they love to build stuff together so some time next year, I'm turning them loose! Borrowing. We're borrowing tons of stuff from friends and family. Lawn games, plywood table tops, speakers, and so on. Excited that they want to share and excited that this saves us money. Phew! I'm guessing that this is not an exhaustive list of everything that we'll be delegating during the course of our wedding planning but it's a good start. So how about you? Are you hoping to delegate any portions of your wedding? Have you already asked people for help? How did you choose them? Fire away!